PLEASE NOTE: We offer several more environmentally friendly alternatives to "Foamed PVC" as PVC will give off very toxic "dioxins" when incinerated as waste for disposal. To view a table comparing all the alternatives & showing available sizes please - click here. This is a fantastic material to cover things in to make them colourful. They do not require paint maintenance afterwards. The uses list is endless but here are a few - Wall cladding. Advertising hoardings, signs & displays. Interior designer panels. Direction Signs, Theatre Scenery, Walls and partitions. Model making, furniture making, base boards, barriers, wall covering, notice boards. In fact any wood panel replacement and more etc. Can be used for car panels where no impact strength required. These boards are very cost effective. They are very easily cut and drilled. 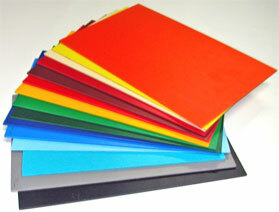 They come in many solid colours and in several thicknesses. They will replace wood panels and have better weatherability. They have a fine closed cell structure. The matt boards are matt finished on both sides. Advertising, Hoardings, Signs, Displays, Direction Signs, Wall Cladding, Theatre Scenery, Model Making, Base Boards, Notice Boards. Benefits Availability varies between supplier- please see colourchart page for full range. We also supply the FOAMALUX range and others with GLOSS colours.